The Magnesium Home Page is best viewed with Netscape Navigator 2.0 or later versions. If viewing with other browsers or earlier versions of Netscape, the tables in this page may not look very nice. If this is the case with you, we suggest you upgrade your Web browser. Magnesium is the lightest of the structural metals with a density of only 1.74 g.cm-3. 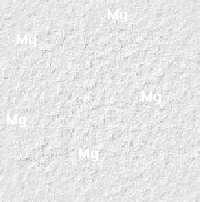 However, magnesium is used as a structural metal in an alloyed form and most magnesium alloys have a density slightly higher than this. Magnesium is a reactive metal and is usually found in nature in the form of and oxide, carbonate or silicate, often in combination with calcium. This reactivity is one of the reasons why the production of magnesium metal requires large amounts of energy. The world production of magnesium is small compared to the other structural metals such as steel and aluminium at only about 300,000 tonnes per annum. About half of this is used directly in aluminium alloys to harden and strengthen them. For example, the body of an aluminium can contains approximately 1.5% Mg and the can top about 4.5% Mg.
For cast metal components from either sand or die casting. This is the area of strongest demand growth for magnesium, particularly in the US automotive market as US car producers attempt to meet current and future fuel economy standards. See Cast Magnesium Components. The reasons behind this move have been summarised in a recent report from Princeton University. Magnesium alloy corrosion anodes, usually for the protection of steel structures such as the holds of ships, oil and gas pipelines and domestic hot water heaters. In the use of fireworks and incendiary devices. The removal of bismuth from lead. Magnesium components are generally in the form of magnesium alloys. The addition of other alloying elements can strengthen and harden magnesium as well as alter its chemical reactivity. The common magnesium alloys are shown in Table 1. Good castability, good mechanical properties at T<150ºC. Greater toughness and ductility than AZ91, slightly lower strength. Often preferred for automotive structural applications. Rare earth addition improves creep strength at elevated temperatures. Pressure tight. Better creep resistance than AZ91 at elevated temperatures but lower strength. In addition to Table 1, there are many specialist alloys. For critical low weight applications, alloys can be used that contain zirconium, expensive rare earths and even silver. Alloy development remains a strong area for research, particularly with a view to improving the corrosion resistance and high temperature creep resistance of cast components. Magnesium is the 6th most abundant element metal on the surface of the earth at about 2.5% of its composition. However, its high chemical reactivity means that it is not found in the metallic state in nature. Sea water contains 0.13% Mg and some production facilities use the magnesium content of sea water for the production of magnesium metal. This is often after the precipitation of other salts which leave a magnesium-rich brine. Other common commercial sources are dolomite ((CaMg)CO3) and magnesite (MgCO3). The calcining of magnesite also produces magnesium oxide, large tonnages of which are used annually for the making of refractories. This tonnage far exceeds the annual production of magnesium metal. There are many magnesium silicate minerals known to geologists but they are rarely pure enough to warrant processing to metallic magnesium. The exception is the Magnola Project, conducted by Noranda in Canada, which is seeking to establish a 60,000 tonnes per year magnesium smelter based on the leaching of asbestos mine tailings rich in magnesium minerals. These rely on the use of ferrosilicon to reduce magnesium oxide in a molten slag at temperatures of 1200ºC-1600ºC under a reduced gas pressure above the slag to produce a magnesium vapour. This vapour is condensed at a location removed from the main furnace. The crowns of condensed magnesium are then re-melted, refined and cast. These production routes are capable of producing magnesium of purity as high as 99.95%. Commercial magnesium electrolysis is conducted in a chloride melt of mixed alkali metals at temperatures usually below 700C. The feed to the electrolysis process is either anhydrous magnesium chloride, MgCl2.KCl produced from dehydration of carnallite or partially dehydrated magnesium chloride. Pure anhydrous magnesium chloride is probably the preferred feed material. However, the production of magnesium chloride with low levels of magnesium oxide is quite difficult, due the hygroscopic nature of magnesium chloride. Unlike the high temperature production routes, the electrolysis processes have difficulty achieving metal purity greater than about 99.8%. This is due largely to the presence of 300-400 ppm of iron due to contact with steel components in the electrolysis cell. However, for production of greater than 10,000 tonnes per annum, the electrolysis process develops cost benefits over the high temperature processes. Magnesium is one of the metals like aluminium where very little post refining of the metal is conducted, other than the removal of physical impurities such as electrolyte and oxide (although some processes are available). The high temperature processes rely on the high vapour pressure of magnesium to transport high purity magnesium vapour. The electrolysis processes all rely on chemically clean feed materials and the operation of the electrolysis cells in a regime that favours magnesium reduction over the reduction of other alkali metal chlorides. Molten magnesium burns in air to produce a brilliant white light and large amounts of heat. Many people who did high school chemistry remember burning magnesium ribbon. This propensity to rapidly oxidise is one of the reasons that magnesium has not had the wider acceptance as a structural material as aluminium. Molten magnesium has been traditionally protected by the use of alkali metal fluxes which melt and form a liquid covering that restricts access of the air to the metal. Alternatively, sulphur dioxide has been used. Whilst both of these methods are effective, both result in significant corrosion of surrounding equipment and present a health hazard to operators. In recent years, the use of dilute mixtures of sulphur hexafluoride in either dry air and/or carbon dioxide have become the industry norm. Sulphur hexafluoride is colourless, odourless and non-toxic gas. It does result in minor corrosion problems if used in the wrong concentrations and in recent years has come under attention as a greenhouse gas. One redeeming feature of magnesium is the ability to contain it in molten form in steel containers. The low melting point of 650ºC (even lower for most commercial alloys) and the limited solubility of iron in magnesium at temperatures below 700ºC (about 400 ppm) means that magnesium can be contained in heated steel vessels and pumped in a manner like water, using heated steel pipes. The largest growth market for magnesium is for cast (die cast or sand cast) components for automotive applications, particularly in the US market. The reason for this is the US Government's CAFE regulations which require fuel economy targets to be met by automobile manufacturers annually. One way to achieve these targets is to make cars of lighter mass. Hence, there is a large interest in the substitution of steel components in cars by the lighter structural metals, magnesium and aluminium. The aluminium industry has been more successful at achieving this substitution, due in part to the good corrosion resistance of aluminium and familiarity with its use. However, in recent years magnesium has been gaining popularity as the chemical purity of the alloys has been improved, resulting in a significant increase in corrosion resistance. The use of sulphur hexafluoride as a cover gas instead of flux has also resulted in an increase in physical purity and an easing of the difficulty of molten magnesium oxidation protection. There is a problem with this increased use of magnesium. Demand for magnesium die cast components is growing at about 15% per year and is scheduled to outstrip supply of available primary metal by the end of the decade. This is keeping the price of magnesium metal high and providing a disincentive for its use. New production capacity from a number of new smelter projects and expansions of existing smelters is expected to ease this tight supply situation towards the end of the decade. The editors of this home page have found very little information on magnesium on the Internet other than that related to the importance of magnesium to the health of humans. This was one of the driving forces for the formation of this Home Page. The magnesium industry is also somewhat secretive and good published information is a little difficult to find. Try looking through the Links Page at the Internet information we have uncovered. The Annual International Magnesium Association (IMA) Conference Proceedings provides a good place to start and gives good information on the uses of magnesium and the supply and demand situation each year. The IMA also produces an excellent Buyer's Guide ever year of suppliers to and within the industry. They can be contacted by e-mail. Magnesium Monthly Review, published each month by Bob Brown provides up to date news of developments in the industry. The 3 International Magnesium Conferences (the latest was held in Wolfsburg in Germany in April 1998) organised by The Institute of Metals provide some up to date scientific research findings, although of somewhat academic interest. The Annual TMS Light Metals Conference usually contains a few magnesium papers. The Feb. 2000 Conference in Nashville will have a parallel magnesium conference. TMS also has a Reactive Metals Committee which has interests in magnesium. The ASM Handbook Series, formerly known as Metals Handbook also has some good general information on the use and properties of magnesium alloys. The CRC for Alloy and Solidification Technology (CAST) in Australia and the Institute of Magnesium Technology in Québec (ITM) both have large research programs in magnesium, in particular cast magnesium products, that are non-aligned to any magnesium producers and could be useful sources of information. The CAST Design and Prototyping Service can supply more information about designing cast components in magnesium alloys. For further information on the Statistics of metal production and recycling in the United States of America (USA) try looking at the Minerals Information section of the US Geological Survey. Natural Resources Canada now publish a Nonferrous Metals Outlook on the Internet with a magnesium section which can be download as a .pdf file. The IMA Annual Meeting proceedings provide a good introduction in this area but with an automotive bias. Øye  and Høy-Petersen et al  give good summaries of the range of production processes. Their references provide sources of information on the various production routes. Good safety information is available through The International Magnesium Association [4,5] and includes both written and audio-visual material. All of the major magnesium suppliers will supply general handling information for their products and physical property data on their alloys. 1. Busk, R.S., Magnesium products design, Marcel Dekker, New York, 1987. 2. Øye, H., Proceedings of the Elliot Symposium on Chemical Process Metallurgy, P.J. Koros and G.R. St. Pierre Eds., Iron and Steel Society, 1990, 33-50. 3. Høy-Petersen, N. et al, "Magnesium" in Ullmanns Encyclopedia, 559-580, 1989. 4. Lockwood, L.L., Recommended practice for melting high purity magnesium alloys, International Magnesium Association. 5. Magnesium: Safe handling for manufacturing, storage and use, Videorecording, International Magnesium Association.